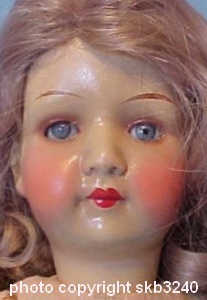 1930 Kohnstam Tessie doll face, 14" tall, bisque head, sleep eyes, painted lashes, closed mouth, wigged, cloth stuffed body with disk jointed limbs, stitched fingers, doll marked Tessie Germany 4/0. as shown below. 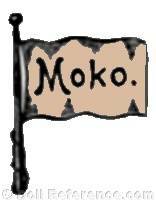 The M. Kohnstam & Company, MOKO, a toy and doll distributor, importer and exporter was founded by MOses KOhnstam in 1867 in Fuerth or Fürth, Bavaria near Nuremberg, Germany. At a later date in London, England Moses' son; Julius Kohnstam founded the Keen Company (1913-1933). 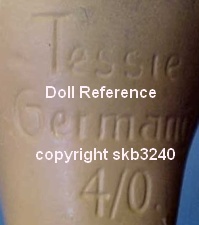 The Kohnstam company is primarily known for their diecast toy products, they also distributed dolls, a marked doll has been found with both a Hermann Steiner of Sonneberg and Neustadt, Germany, HS mark plus the MOKO Bavaria mark - so H. Steiner supplied some of the Kohnstam bisque head dolls and was likely the supplier of the German Tessie doll, shown above and left. Ernst Heubach of Koppelsdorf also supplied bisque doll heads to Kohnstam. 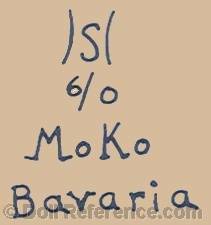 Some Kohnstam doll marks Cupid, DDD and MOKO initials, see below for more doll mark images. 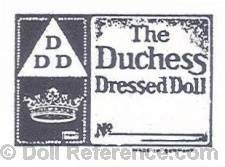 Additional Kohnstam doll names; Biddy Baby doll, 1909 Cupid doll, Japanese Baby doll, 1923 Lola doll, Lydia doll, 1910 Mothers Darling doll, 1926 Nanette doll, Princess Bett doll, Princess Charming doll (E. Heubach doll mold 320), 1915 The Duchess Dressed Doll, Newborn Baby a bent limb baby doll, Sam Boy a black bent limb baby doll, Sonny Boy a white bent limb baby doll.